Here is Simplicity 5382, all finished! The embroidery took about an hour to work, the crocheted edging a bit longer. Bridget, my granddaughter, saw the embroidery and said, "Happy Birthday!" She still isn't too clear on the concept of Christmas. I made a few modifications on the pattern, adding pleats to the bodice instead of gathers, and a few little pleats on the sleeve hem. I made the nightgown a size 4 so my granddaughter can wear it again next year. Unfortunately, she was pretty cranky every evening, so I was unable to get a photo of her in it. This was a pretty easy pattern, and I plan on writing a review in Pattern Review when I get a few minutes. So where have I been these last few weeks? Up to my ears in all sorts of things! As I mentioned in a previous post, the computer crashed and I just now have a bit of time to actually work on the new one. Much of the software was pretty old, so we're updating, and installing Office, Parallels, Adobe Photoshop Elements, among other things. In fact, I'm installing Office while I'm writing this. 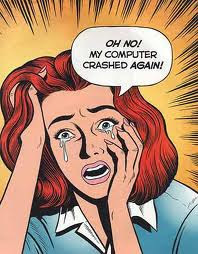 Right about the same time the computer crashed my mother had a heart attack and then open heart surgery. She's back home and doing reasonably well. One really great thing about having a large family is that there is always someone around to visit. I have four siblings in the area so in all good conscience I was able to leave Mom to have Thanksgiving with my DD in Colorado. I'd have no luck at all. That's right, my trusty Mac crashed, or rather, slow rolled. It developed that eternal "spinning CD" icon Sunday so we took it in, found it had corrupted system file, so had the hard drive reformatted. Since then I've been trying to restore the data from the backup drive with no luck. I have finally made an appointment to have the Geniuses at the Apple Store do it next Saturday morning. 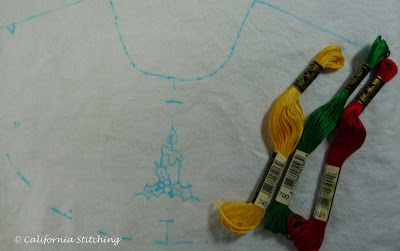 Then we leave for Colorado a week from today, so not only will I not be posting much, I won't be stitching much at all. I have made quite a bit of progress on Simplicity 5382 - Christmas Nightgown. In fact, I have it put together and just need to finish the crochet trim and add buttons with the loops. 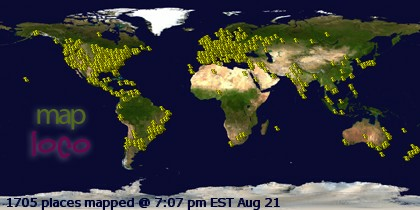 So please be patient, eventually I'll get all my photos back and will be up and running. It just may take a couple of weeks. Until then, Happy Stitching, Thanksgiving, and Christmas Tree Trimming! 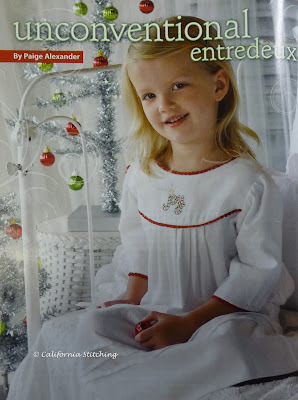 I have a rush job going on now as I've decided to make a Christmas nightgown for my granddaughter. I saw this pattern in Joann's but of course it was out of stock. So I went online to Pattern Review to read the reviews (only two) and bought it for only $2.99 on sale. Pretty good deal. Ever since I saw this article in last year's Sew Beautiful Issue No. 133 I have wanted to make it. The flannel on Joann's wasn't on sale, but I bought it with one of those handy 40% off coupons. Another pretty good deal. I'm making View A but with entredeux in the yoke and sleeves so I can crochet the scalloped edging. I'm also making pleats in the front, back and around the sleeve hems. I whacked off about three inches from the sleeves so they will end just at Bridget's wrist, not three-quarters length as in the magazine photo. After skimming around the internet searching for clip art (the magazine article uses machine embroidery) I came across a candle/holly drawing which is just right. After sizing it to 2 inches high I embroidered it with just three colors, DMC 743, 700 and 321 which keeps it really simple. It took all of an hour to work. I'm sure it would have taken me much longer to do it on the machine as I haven't done much machine embroidery in the past several years. As of this writing, I have the front and pack put together and pinned to the yoke. I used Bunny's (from La Sewista) tutorial on pajama plackets for the back to make it very sturdy. I'm also using her recommendations for seams, which is to sew the seams, press to one side, serge the seam allowances, and topstitch to mimic a flat felled seam from the right side. This is why we read these blogs, to learn all these great techniques! Bridget is a size 3, but I'm making this a 4 but with a length of size 5. 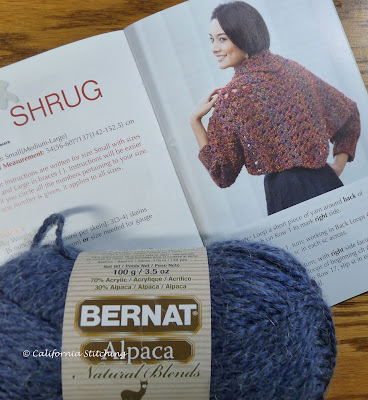 I plan on crocheting the scallops on the drive to Colorado for Thanksgiving, and will hem it there with a growth tuck so she can wear it for another year or two. I'll buy some rick rack or more floss in the DMC 321 (red) for feather stitching to hide the seam once it's let out. So I changed my mind and started some tiny crocheted afghans. They are quick and easy to do, and soon I should have the patterns memorized. I made one out of Caron Simply Soft acrylic yarn, started another, then ran out and had to buy another skein. I'll try to make a few little bitty hats out of the leftover yarn. Then I bought two skeins of Lion Brand Baby Soft and have made two afghans so far and am still on the first skein. These are great car projects are they are pretty easy and that's what I need, easy! It's also a great way to use the 40% off coupons for Michael's and Joann's. I throw so many of them away it isn't funny. 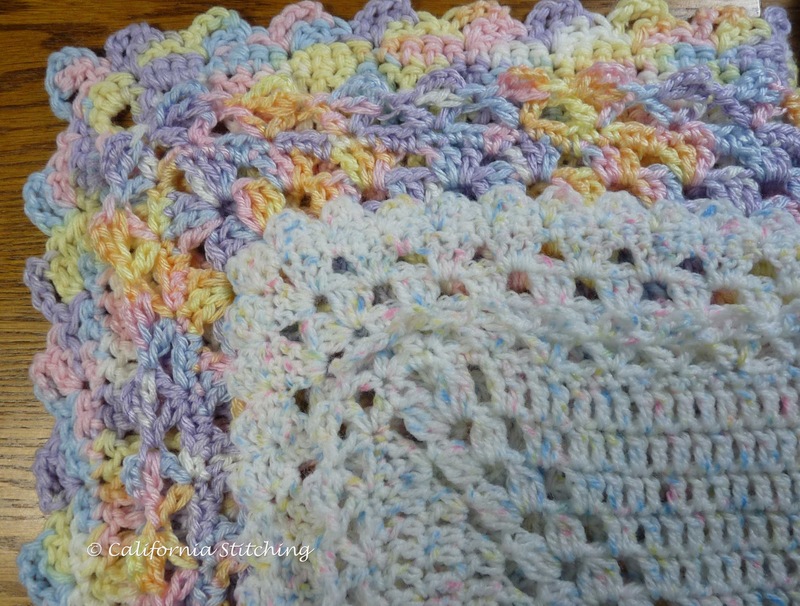 The patterns are from Leisure Arts 63 Easy-To-Crochet Pattern Stitches that I picked up from Joann's. I used patterns that are worked in the round so I can make them any size I want. 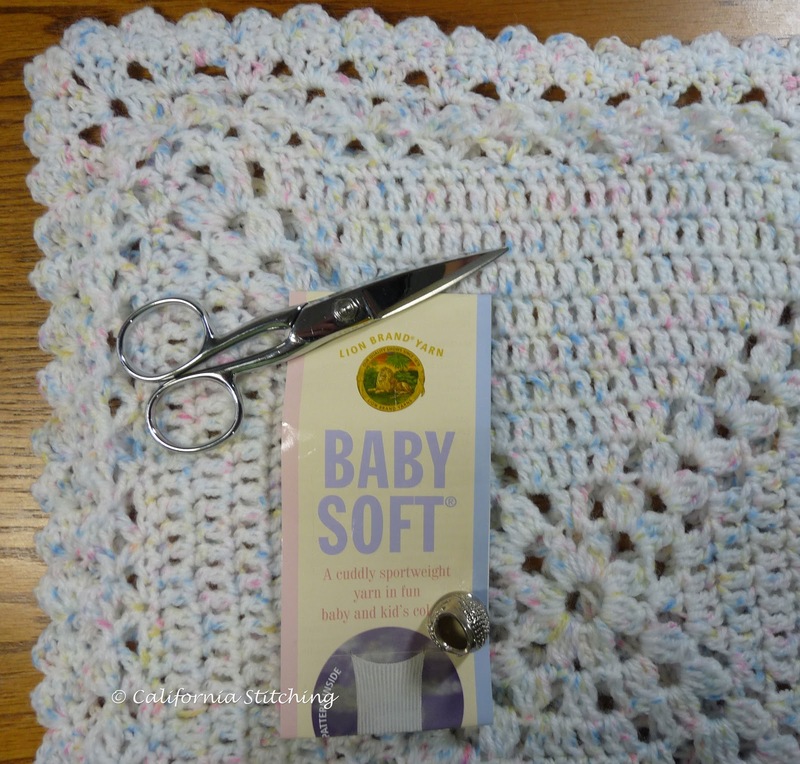 Robin Hart, who has commented several times on this blog, heads up SAGA's Wee Care program and says that the afghans should be approximately 13-14 inches square. Please email her if you would like to participate in this worthy program. 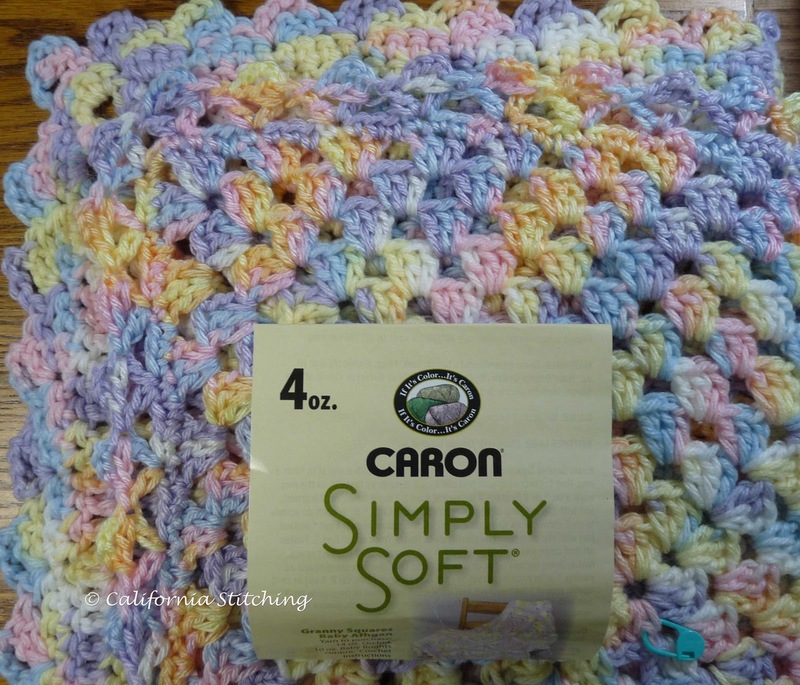 There are lots of free patterns available at Crochet Central, this link gives you the 12 inch square patterns. 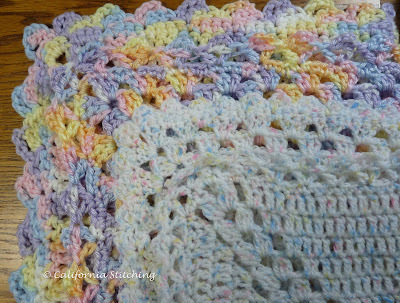 All you have to do is make it in baby yarn, add a sweet shell edging, and you're done! Eventually I will tire of making them and will need a break, then will switch to the shrug pictured above. I'm home today with a cold, and since it is raining I've made a fire in the family room fireplace and have been working (not on fun stitching projects, but on real work) while watching chick flicks. Well, they are my sort of chick flicks. I have watched Room with a View and am now working on The Age of Innocence. I had better get back to it before the guys I live with (son and hubby) get home!